We have written several posts about ways to instill capability in our children. When we provide an environment where they can succeed independently, we send so many wonderful underlying messages to them - you are capable, you are worthy, etc. Giving children choices and power over their world translates in to happy, confident toddlers as well as less power struggles and challenging behaviors. Here is a compilation of ideas we implement for our children - ranging from ages 7 months to 3 years old. My son's platform bed has drawers - organized for easy access. My husband built a shoe rack in our garage where we organize our shoes. My son's shoes are kept at his height - easy to find, easy to access. My son has his plates, bowls, and utensils in a low drawer where he can access them himself. We do all of our laundry together - there is no reason to separate anything except into colors, whites, and towels. I have two baskets in the bottom of the linen closet - one for colors, one for whites - my son puts his dirty clothes in the baskets and has been known to pull them down to the washer to do a load on his own - he's 3. I don't use this (I did in my classroom when I was teaching, though), but a great way to organize books on tape/CD is by using Ziploc bags. Easily accessible to the child. My son has full access to a CD player and his CDs. To help him be successful I print the images on sticker paper and stick them to the CDs. We installed an extendable shower head so my son can wash his hair independently. Provide them with stools and such so they can make their own meals. 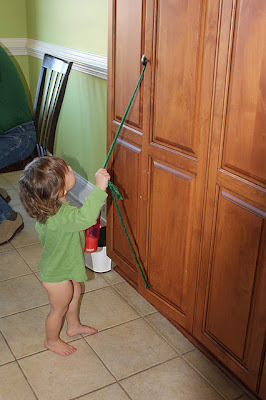 Tie yarn around doors to allow them to open them. Make language magnets of food to give them choices. Give them rhythm charts to allow them some control over planning their day. Organize snack and have them at child level to give them power over their own eating. you have the best ideas (i probably say this a lot). i loooove this blog! My daughter isn't old enough forthis yet, but I have a friend with a 2 year old and I think the little girl would eat every bit of food in that tub at once. How do you make sure they don't gorge themselves? Love the ideas. Think you're brave. I have the same question as Sarah. I also felt a little guilty that I purposely child-locked my cabinets so my little one couldn't get into them. 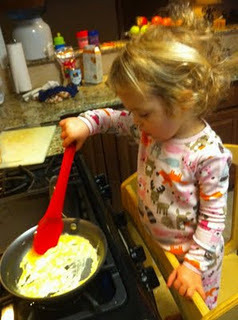 Except for 2 that have the plastic bowls or pots and pans and things she can play with. Definitely going to try the magnet thing soon. I responded to Sarah.....see above. We never baby-proofed a thing - not everyone is comfortable with that and that's ok. I love those rhythm charts from http://www.akidsday.com/. I love all of your ideas! I'm not a mom, but I am a teacher. Actually, I tutor English to children of all ages in Vienna, Austria. I'm struggling to find ways for my littlest ones to access and use the English language daily (I only tutor them once a week). I LOVE THE FOOD MAGNETS! I'm going to research how I can get the materials to create this project. (If I were in the US, I'd know exactly where to buy the materials.) Then, my little ones and I can work together to make them and the end product can stay at home, hopefully, the parents will allow the children to keep the magnets on the fridge. I love it! I love it! I love it! By the way, do you have other activities on your site specific (or particularly appropriate) for ELLs? Thanks for providing this blog for all of us! can you explain a little more about the rhythm chart?? I want one of those stools so bad. I saw one for about $300. Did you make yours or buy it? My friend's husband made one for us; we actually painted it to get it ready today! Here's a link to the plans--it only took him an afternoon. So much cheaper than the $200 learning towers! I have a toddler who loves to empty everything. I mean everything! For the last year, she has emptied out her drawer of cups/utensils at least twice a day. Sometimes she will put things back (not neatly, of course) and sometimes she is immediately out the door and onto the next thing after tossing one or two items back where they go. Laundry hamper? Empty it out! Bins? Dump them out! I hoped it would be a short lived phase but at 21 months she hasn't slowed down a bit. Any advice for parents of huge emptiers/dumpers? We are about to move into a new house. It is going to be epic. With my older child we really never needed to baby proof, other than say medicines. #2 has been a whole new experience. I like for her to explore, but I am trying to find the balance of my sanity as well! I allow my son to empty and then we put a lot of emphasis on how we then need to tidy. At first I helped him so he understood what "clean up your mess" actually meant, but now I can tell him to put whatever he's strewn about back into its bin and (most of the time) he does it. Great ideas! I've used some of them in my home and it makes a huge difference. You are absolutely right, we have less power struggles and the kids (19 months and 3 yrs) both love to help me with basic chores and they get so excited when theey are able to do something on their own. They can even make their own chocolate milk! Jorie - I have two of those (a 3 and 1/2 year old and a 2 year old - and a 9 mo. old, but he's not there yet). I love some of these ideas and wish I could be more open with letting them do things themselves, etc. but I've already about lost my sanity, so cleaning up milk and everything else spilled out of the fridge when I let them in there does not sound like fun. We have baby proofed everything we can and it's still not enough to keep them out of stuff and just making messes. I really don't know how other people do it. I like the snack bucket idea. My 28 month old, if he just goes in the fridge willy-nilly, will just dump out stuff and I'll end up with chocolate syrup and soy sauce everywhere. If there was a specific place for him to look for snacks, it would be easier on the both of us. We already have a version of this for non-fridge food. We have an orange bowl on the counter that my two older kids (4 and 28 months, the 5 month old doesn't need real food lol) can reach on their own that holds vegetables and fruits that they can take whenever they want and there are some snacks on a baker's rack they can choose from (granola bars, juice boxes, bottles of water, etc) and that setup has worked really well.